In a market prone to 800-point nosedives on trade war speculation alone, seemingly cheap stocks can still get cheaper. So even longer-term investors may be better off waiting this dance out until the coast is truly all-clear. “We don’t think it’s a buying opportunity yet,” veteran strategist Liz Ann Sonders at Charles Schwab tells Yahoo Finance. Sonders ticked off numerous reasons for investors to be cautious: the newly inverted yield curve that may be signaling a looming recession; the bear markets in high-growth tech company stocks such as Amazon; the draining of liquidity by global central banks and increased weakness in many key economic indicators. “We have been saying [to clients] you don’t want to take any excess risk beyond your normal allocation, and if anything, [trim stock exposure] into strength and use volatility for rebalancing purposes,” Sonders says. To her point, take fresh leading economic indicators data that only fans the bearish flames. The leading economic index (LEI) rose 0.1% in October on the heels of 0.6% and 0.5% increases in the prior two months, according to the Conference Board. The LEI is a weighted gauge of 10 measures used to signal business cycle peaks and troughs. The October reading marked the first slowdown in the pace of growth since May. “The index still points to robust economic growth in early 2019, but the rapid pace of growth may already have peaked. While near-term economic growth should remain strong, longer-term growth is likely to moderate to about 2.5% by mid- to late 2019,” says Ataman Ozyildirim, director of economic research and global research chair at The Conference Board. Meanwhile, the latest initial claims data touched a six-month high. It’s yet another signal the U.S. economy could be slowing underneath the weight of the U.S. trade war with China and rising interest rates. Other market pros Yahoo Finance has talked with say fears of a late cycle U.S. economy will keep a lid on stock prices in the near term. In their collective view, tightening credit conditions – brought on by the Jay Powell-led Fed – are a risk that investors are underestimating. One can’t blame veterans like Sonders for striking a cautious tone right now. The Dow plunged nearly 800 points on Tuesday amid concerns over the inverted yield curve, mixed messages on President Donald Trump’s trade deal at the G20 and ongoing fears on Apple’s outlook. The ongoing slide in the financials was also high atop the list of concerns. All 67 stocks in the S&P Financials Index declined on Tuesday, according to Bloomberg data. 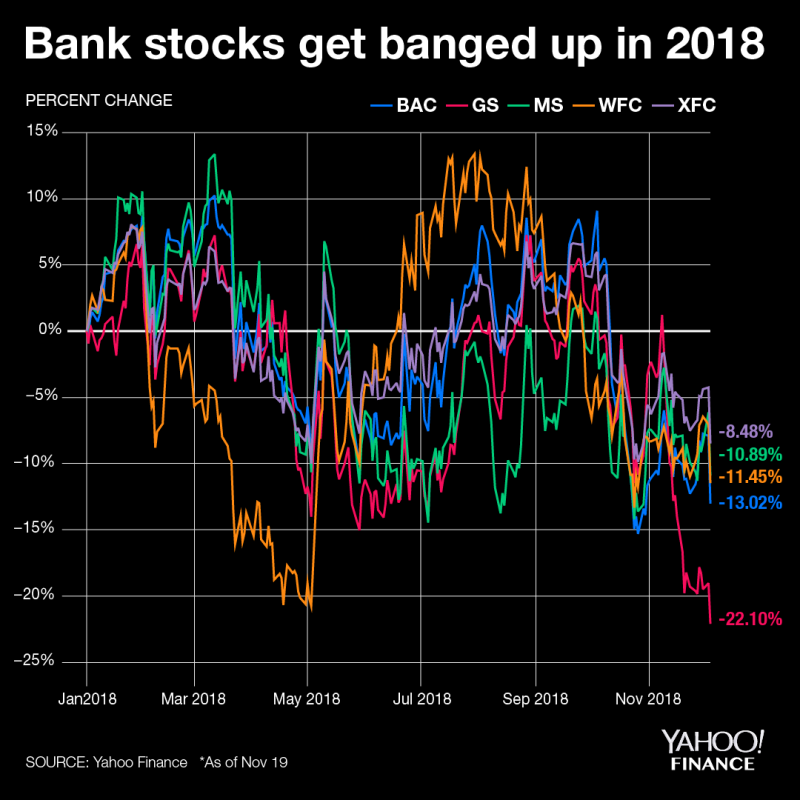 Regional banks led the way down. The financials were the worst-performing sector in the S&P 500. Goldman Sachs plumbed fresh 52-week lows. Tuesday marked the 22nd 3% down day of this bull market, Keith Lerner, chief markets strategist of SunTrust, points out. Stocks rebounded a week later following 19 of those prior instances with an average gain of 2.6%, Lerner says. But angst is likely to reign supreme at least for several more sessions. “From a market perspective, you want to see the financials and interest rates stabilize, and the S&P 500 to maintain above the October lows,” Lerner says. Until that happens – and some of the leading economic data begins to firm back up – it’s proceed with caution even for those with long-term horizons.